This is a very easy and rather interesting project using crayons. Only instead of using them for coloring or drawing you are going to melt them and come up with art of a different type. You can use crayons of any type to create a unique art. You can place them on paper – either white or black and melt the crayons carefully to make art that is really one of a kind. You can also mold the melted wax from the crayons into different shapes using different molds.You can also convert the melted crayon into a cute looking candle by setting it in suitable molds and slipping a wick into it. The possibilities of creating art with melted crayons is endless. It is a project that will start on a low key and end up with many creative ways as it proceeds. To get started you need an assortment of crayons, some thick paper, glue, a source of heat for melting the crayons and some waste paper to prevent things getting messy. You can also have a few containers or dishes of smaller size that you can use to pour in the melted crayon and de-mold it in different shapes. If you really want to get this project going keeps some bobbles, sequins and some interesting bits and pieces that you can put on top of the crayon artwork to create a really unique work of art. The thing about working with melted crayons can only be limited by your imagination. You can even make a painting using the melted crayons. All you need to do is figure out what colors and blend of colors you want for your painting. Another thing to get your art project going is having a source of heat that can be used without damaging the color of the crayon. That means this needs to be adjustable. 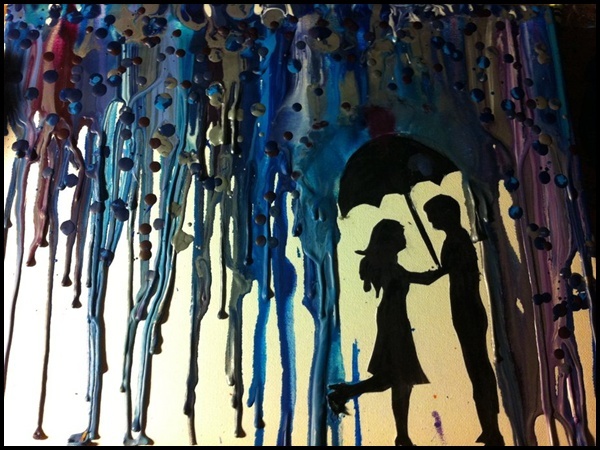 Here are some beautiful Examples of Melted Crayon Art. My first crayon melting art.. Simply amazing ! Never knew about melted art.